Every year without fail. Every year for the past 28 years, Shark Week has kept the viewers watching, the audience soaring and the terror climbing. It’s interesting to note that in its beginning broadcasting days, Shark Week was meant to contribute to the conservation of sharks by giving the public a different perspective than what was commonly perpetrated by the media. Surprising, to say the least, considering the content which has been prevalent on this program for the past decades, meddling the lines of documentary and fiction without qualms, easily pulling viewers into the direction of fake-u-mentary. Hopefully, current Discovery Channel president Rich Ross will live up to his word and reduce the fake sensational docu-fiction from the upcoming show line-up. When I give a conference, without fail, someone asks if I have ever seen a Megalodon. 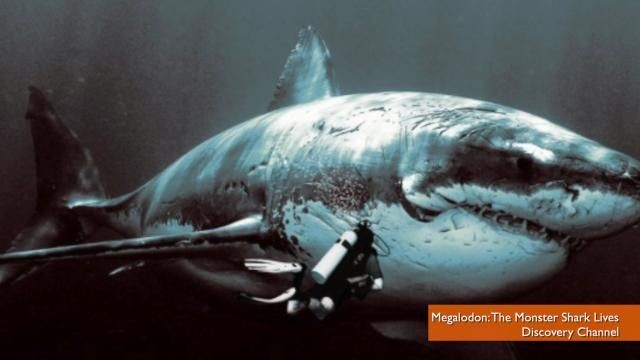 Thanks to Discovery Channel and its Megalodon: The Monster Shark Lives, people believe these long-extinct creatures roam the oceans, in search of fresh human flesh. Nothing could be further from the truth. Sea monsters are an integral part of our primal fears, much like the wolf has terrified children for centuries. Perhaps Jaws could be considered the underwater version of the wolf-incriminating Little Red Riding Hood tale. But these are stories, only stories. Let’s examine facts and numbers. Without bating an eye, which do you think is the most dangerous animal to humans on the planet? The answer stings it’s so unexpected and it bites no matter how you slice it. It’s the mosquito, it’s the tick, it’s the flea, take your pick… but it’s certainly not the shark! These tiny critters can be the vectors of severe infections. On the other end, sharks only cause about a dozen fatalities a year, in the whole wide world. So, why don’t we hear about the thousands dying of a mosquito-borne disease every year? Because dying from malaria is a slow process which does not garner press. On the other hand, an incident with a shark means guaranteed sensationalism with media hovering all over it, like a bee swarm. Why do people so easily believe that sharks are so dangerous to humans? Perhaps because the dark has been a source of fear, since the dawn of time. When it comes to the sea, we can’t really see what lurks beneath. Fear makes us lose all reason and while it is a natural reflex for self-preservation, terror is not. We need to gain reasonable perspective by educating ourselves. It is estimated that between 40 and 100 million sharks are killed by humans every year, be it whether brutally mutilated for their fins, or caught by accident in fishermen’s nets. Clearly, the scales are not tipping in the favour of the sharks. Yet, sharks are still a symbol of fear. Old habits die hard. In 2009, WildAid made a public service announcement starring NBA high profile athlete Yao Ming (姚明) addressing the issue of shark fin soup. Talk about putting one’s celebrity to work. Yao Ming was not afraid of questioning the ancient status symbol which is without a doubt the principal reason sharks are decimated around the world. 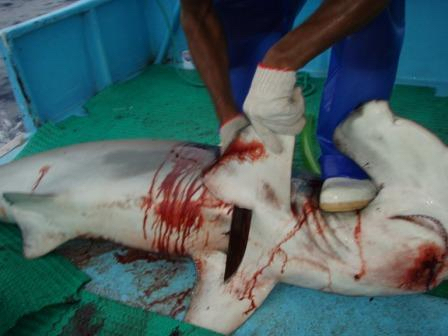 Other than the unmeasurable level of cruelty towards these animals (the fin is cut off while the animal is alive and the animal is thrown back in the water where it will suffocate), the level of fish stock to feed humans are plummeting because the apex of the food chain (the sharks) is no longer able to regulate the populations of the sea creatures. In other words, by killing sharks, we are screwing with our future. I am not saying sharks are not dangerous. I am only suggesting you change your mind about them. They are not are evil creatures which deserve to be killed. They have a very important role to play in the ocean, and therefore we need them for our own survival. As bizarre as it may sound, it is in our selfish interest to protect them from the current onslaught which has already brought many species of sharks down by 99% over the past 50 years ! 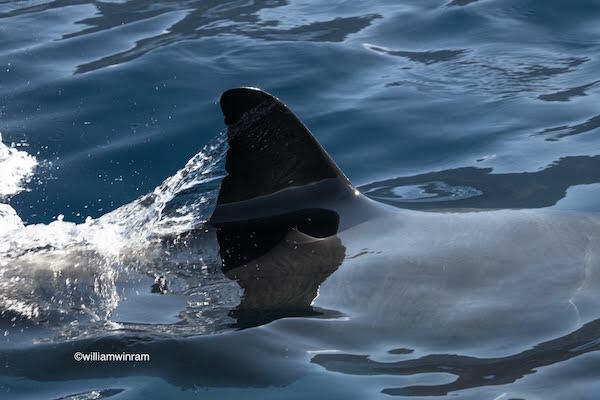 Last but not least, remember when you go out and play in the ocean, that you are entering their territory and you have to do it with eyes wide open, with care and precaution. Educate yourself about the area and know what encounters you may have. Take responsibility for your actions.